If there is any strife in her marriage to Dean McDermott, Tori Spelling didn’t show it when she posted a happy family pic on her website, wishing fans "Merry Christmas from the McDermotts!" Earlier this week, UsWeekly magazine reported that Dean allegedly had a brief fling with a woman in Toronto. 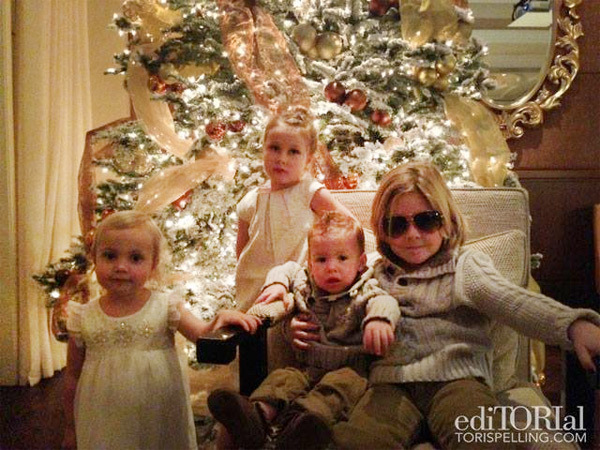 Rather than comment on it, the mom of four showed off kids Liam, 6, Stella, 5, Hattie, 2, and Finn, 16 months, in front of a decked out Christmas tree. She wrote, "As another year comes to a close, I can't help but feel so grateful for all of my blessings. My beautiful family, my amazing friends, and of course, all of you!"